Though I’m not familiar with him, Otley Beyer (1883-1966) looks like he published a great deal on the philippines. There are 28 entries by him in the Harvard library system here, all on the Philippines. However, I don’t see any that look like a memoir or diary from his time during the war. Exploring his wartime interactions with the Japanese and lecturing the Japanese military police, or the Kempeitai, which was the core institution of brutal repression during the occupation, might be an interesting paper for someone who has access to his papers in Australia. Otley Beyer collection – at the Australian national library. See more here. A finding aid to the collection can be found here, including several boxes from his World War II papers. The US occupation of Japan after World War II was not, relatively speaking, a violent one and though the behavior of occupation troops in Japan did lead to many complaints, there is also a surprising amount of praise for them in various Japanese sources I have come across. They certainly did not live up to the propaganda images of savage American beasts that were expected to arrive in Japan after surrender. What do we make of this case? Even with the court documents and the press that followed, there is not much to go on when it comes to Hicswa’s motivations. We might be tempted to say that he was driven to a murderous rage by the horrors he witnessed on the battlefield during the Pacific war. However, Hicswa first enlisted in 1943 and had no record of combat service during the war. He was assigned to Headquarters Battery for Division Artillery, 98th Infantry Division where he served as a radio operator and later as a bugler.21 In fact, he may be an example of the kind of case I have seen mentioned in many wars: soldiers who had yearned to participate in the action and kill some Japanese, only to have the war end without ever having been given the opportunity for such glory. Scheduled to return to the US the following day, did Hicswa want to make sure he could claim at least a few enemy kills from the war? A more mundane explanation may be to link Hicswa’s drunken violence to a pattern of violence in his own family. In 1947 his father was arrested in Wallington, NJ for assault and battery. He attacked two police officers who went to his home in response to a complaint by his wife that he had become violent while drunk. After arrest, he attempted suicide.22 However, I find nothing to contradict another possibility, especially given the attempted suicide: that his father developed such behavior in the aftermath of the horrible shock of their son’s conviction for a double murder. From the perspective of US-Japan relations though, are other points that are worthy of note. Though perhaps unsurprising for a country emerging from a “war without mercy,” completely absent from any of the US media coverage was any sympathy shown for the two Japanese civilians who were stabbed to death. Indeed, the announcement put out by MacArthur shortly after the movement for clemency gets underway goes out of its way to malign the victims through quotations from anonymous letters, as I have noted. The only place I have found their names mentioned, were in the board review opinion where the private was accused of having “with malice, aforethought, willfully, deliberately, feloniously, unlawfully, and with premeditation kill” SUGITA Yasuichi and NISHIMOTO Choji, “a human being by stabbing him with a sharp instrument.” Though I suspect this declaration of the humanity of the Japanese victims is standard legal language, it is comforting to see the Americans acknowledging it. Only a few days earlier, Japan’s emperor was busy declaring his own humanity to the people. Despite the reputation of militaries everywhere of guarding their own forces when accused of crimes against civilians, it is admirable that the sentence Hicswa was ultimately given in that first year after Japanese surrender was so long, especially in the face of huge public and political pressure for his release in the US. In the end, though, the most interest part missing from this story is the Japanese side. Did anything get reported on this in Nara at the time? Did rumors spread? Did Kubai and Takeda leave any writings behind about their involvement in the case? Did the families of Sugita and Nishimoto take any action? What actions were taken at the government level between the US and Japan to handle the fallout from the case? Any readers here know more? UPDATE: In the comments Nakanoshima points to a 2008 speech in Congress by 8th District Congressman Bill Pascrell honoring WWII vet Hicswa as a “a proud American, willing to do whatever was needed to defend and protect the freedoms and liberties that make this country so grand” and makes no mention of his conviction for two murders. I haven’t contacted Pascrell and it is possible he didn’t know about this fact, but given the huge support for Hicswa in his local community, it would not be surprising if he was aware of the details of the case. If it is the same Hicswa, he has surely long since served his time for the crime, but to be honored in Congress is, at the very least, awkward. John Dower’s book War Without Mercy does a great job at talking about, and showing images of the many ways that race played a role in the propaganda and deep racially coded hatred the United States and Japan had for each other. Any good history of Japan or US-Japan relations that covers the war can now hardly avoid the topic. The wonderful online exhibit Dr. Suess Went to War also has a wonderful catalog of the kinds of images found depicting the enemy, including a whole section on Japan. As Dower and many others have pointed out, the more dehumanizing portrayals of the enemy create an environment in which the soldier feels that the enemy race is itself a kind of disease or vermin that needs to be exterminated. 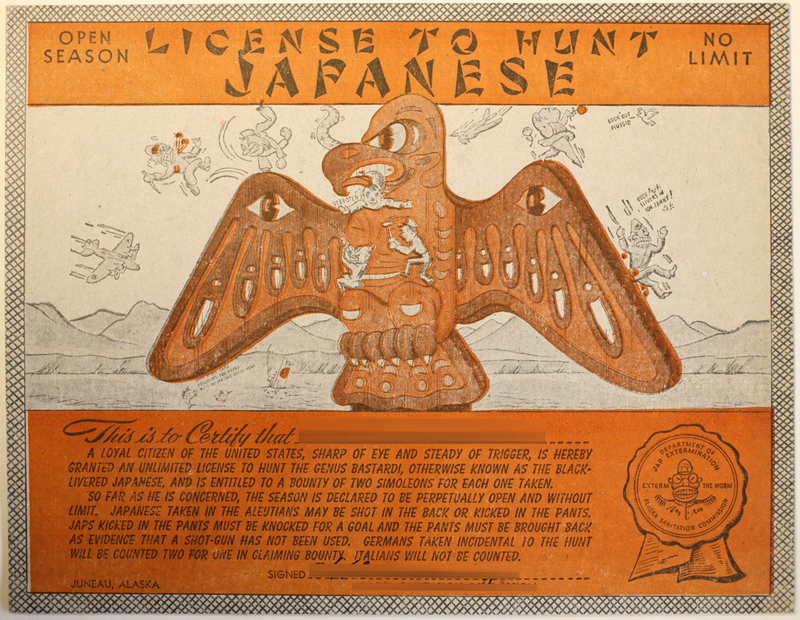 Though examples abound, I recently came across a particularly elaborate example of this that I had never seen before and which I thought I would share: A “License to Hunt Japanese” issued to an American who did not fight in the Pacific War but would later serve as a US advisor in occupation Japan. The image and accompanying text simultaneously captures a number of the features found in the more disturbing propaganda images. UPDATE: I received an email which pointed out that the image of the soldier in the first image is a most likely a caricature of Hirohito. There are two creative processes that I find particular mysterious. Coming up with the names for musical bands…and shipping designators. In April I made a short posting about an interesting work of fiction from 1907, called Death Trap by R. W. Cole1 that depicts a future German invasion of Britain that is repulsed only thanks to the valiant efforts of the Japanese military. Here at Frog in a Well we have attempted to occasionally go beyond our role as a publisher of three group weblogs on the history of East Asia. Though it still has very few entries, our Frog in a Well Library contains some primary historical documents. The East Asian Libraries and Archives wiki contains a slowly growing collection of entries with useful information about libraries and archives in East Asia, as well as other information on databases, organizations, and links to other similar resources. We would now like to announce a new addition: Frog in a Well Guides. Here we would like to host a collection of guides, created by students or scholars of East Asia. We currently imagine these to be primarily bibliographies or research guides tailored to specific areas of research on East Asia. It is inspired by other wonderful existing resources such as the Modern Chinese History bibliography, the Korean History Bibliography, and most of all the wonderful work by students of Professor Henry Smith’s Japanese Bibliography course at Columbia University. All the guides will be published with a Creative Commons license to allow the greatest possible freedom in using them, and we welcome edited, revised, or expanded versions of existing guides by new authors. Also, each guide will have its own page on the EALA wiki where anyone may leave comments, or recommendations for others to incorporate in future updated versions. The EALA wiki page for the guide, if you have suggestions can be found here. Many thanks to Sayaka for contributing this. From 1902 until 1923 the British and Japanese were military allies, bound to support each other in the case of a war with more than a single power and a promise of neutrality otherwise. At its signing, this was primarily seen as a way to counterbalance Russia. Japan would eventually fight on the side of the Entente powers in World War I and engage with Germans in Shandong province, China and in its island possessions in the Pacific. It did not ever play any major role in the action on the European mainland. It is a cute, and surely manufactured story, but it does get at something I have wondered about: did Asian powers who were granting special rights in their ports to Europeans ever seek any similar special trade access to certain ports in Europe?